The goRoam mobile app for fuels, lubricants and chemicals delivery has gone through a major update in the second half of 2018. For hosted customers, we will upgrade your managed devices once you have trained your drivers. On-premise installations should update all mobile devices to the latest version of the 2018.10 release before updating your server and rolling out this version. – Our Android version of goRoam supports full North American and Canadian commercial truck routes using integrated CoPilot® navigation. You can configure truck profiles with the height, weight, length, axle weight, and HazMat restrictions of each of your delivery vehicles so drivers can navigate with efficient and compliant commercial routes. Stay tuned for iOS commercial route capability. – Comply with supplier mandates and stop contamination before it happens. When delivering from compartments, you can configure a truck to require a barcode scan/match of the compartment, the product, and the asset(tank). – This is a great reason to have LCR integration. An automatic, system-generated email will be sent if a driver creates a sale in the LCR® meter outside of a goRoam inventory transaction (delivery, hose flush, etc.). The GPS coordinates, sale number, and total gallons are recorded and sent as an email. This audit happens behind the scenes so dispatchers can see when and where drivers are pumping product outside of a customer delivery. – In addition to the LCR-II electronic register, we now also support the LCR-600. – Think about how much it costs for a truck to make it to the point of delivery. Make the most of being there when delivering to tanks, vehicles or equipment. Drivers can record custom readings for any asset. For example, DEF, engine hours and grease for equipment and vehicles are recorded along with the delivered gallons. You can record any value for tanks, vehicles, and equipment, and then review them in a report. How many bottles of DEF did that asset use last month? How many gallons per mile/hour did that engine consume? Find out now. – If a driver needs to complete orders out of sequence on a trip, but you don’t want to allow this on a regular basis, you can require a one-time PIN code approved by a dispatcher for each order they want to deliver out of sequence. PIN codes force drivers to complete stops in your dispatched sequence while giving them the flexibility to react to unforeseen issues in the field. – When a truck has electronic meters and the driver wants to go in manual mode to enter gallons from the meter, you can require them to get a one-time PIN code to proceed. The idea of PIN codes arose from the need for flexibility and control – you can have both. Look for more PIN code features in the future. – Set up categories and require a description when taking pictures, so you know which pictures are BOLs, receipts, etc. – goRoam records and update for an asset’s GPS location when filling so that you find assets on a map. Find that lost tank or another portable asset. Share filling detail with customers. – We have developed a new enclosure and mounting system that allows installing LCR meter integration on trailers. Our new enclosure keeps the meter integration with the trailer, not the truck. Streamlined workflow – The number of steps required to complete most operations is reduced. It now takes a little less time to start a trip, complete orders, capture meter values for manual delivery, setup and more. 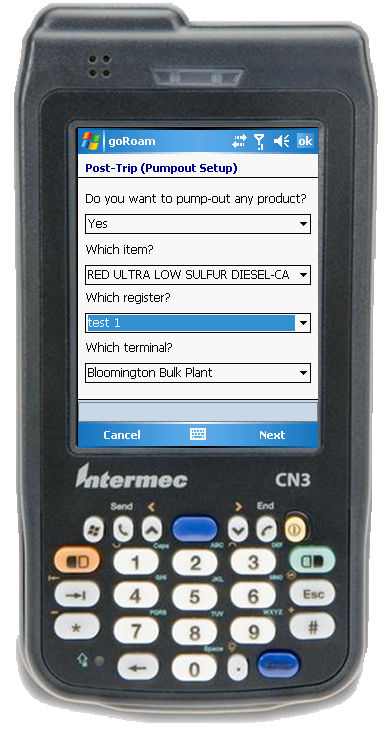 Scan to configure – Do you ever need to configure a spare handheld for a truck but can’t remember the meter address or server URL? Don’t worry! 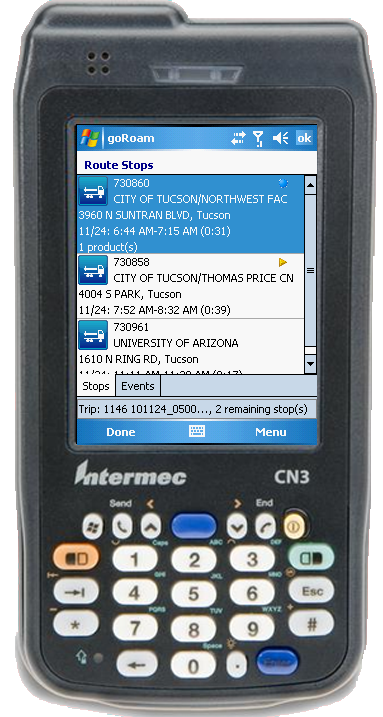 A 2D barcode is all that is needed to configure a handheld device. Scanning a barcode will pair to the truck’s Wi-Fi, connect to the server and company code. This new quick configuration option makes it easy to pair a new handheld or move devices between trucks so you can get back on the road. 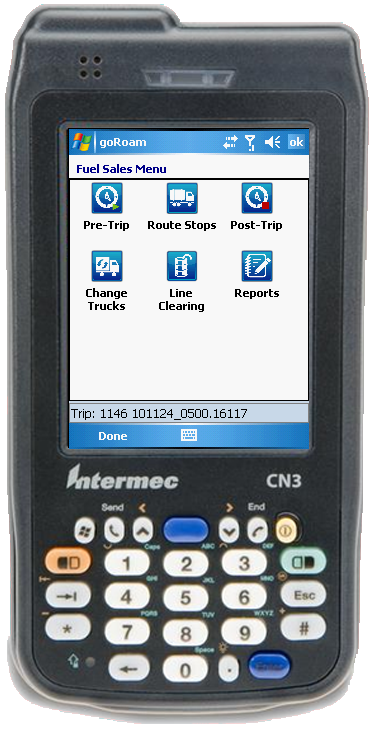 Pre-trip settings check – Before the driver starts a trip, the app runs through a series of checks to confirm connectivity to the server, meter, and printer BEFORE the truck leaves the yard. This prevents drivers from leaving the depot without a working device, printer or truck setup. Easier settings and diagnostics – the settings screen has been streamlined to make it easier to check the configuration and run diagnostics. Web-based dispatch status board – We are moving the trip status board to a web browser so it looks good on a desktop, tablet or mobile device. It shows the status of trips by date and depot. The web-based status board is perfect for dispatch and customer service to see the status of trips. Put it on a large interactive touch screen monitor in the office! In-app chat – Chat from within goRoam and the Mob mechanism for drivers to chat with dispatchers or dispatchers to chat with drivers. Now dispatchers can communicate with multiple drivers at once, there will be a record of all conversations and without the need for phone calls and drivers lining up in the office. Integration into the goRoam mobile app based on Microsoft’s SmartClient framework. This provides strong inter-module integration, so bulk deliveries are integrated with inspections (additional module). Upgrades to the current version of SQL Server CE on the mobile device for faster data access, such as looking up customer assets. Significantly enhanced inventory management on bulk trucks. We support tracking retained products and pump-offs so you can better understand and match inventory versus strictly delivered product. More metrics – we now track how long each asset takes to fuel so you can get better driver metrics at a detail versus aggregate (avg time per asset to fuel). Improved workflow and user interface, including use of finger friendly controls. We have eliminated the need to do horizontal scrolling, so a driver can see everything on one page or can scroll with fingers or the keypad keys. 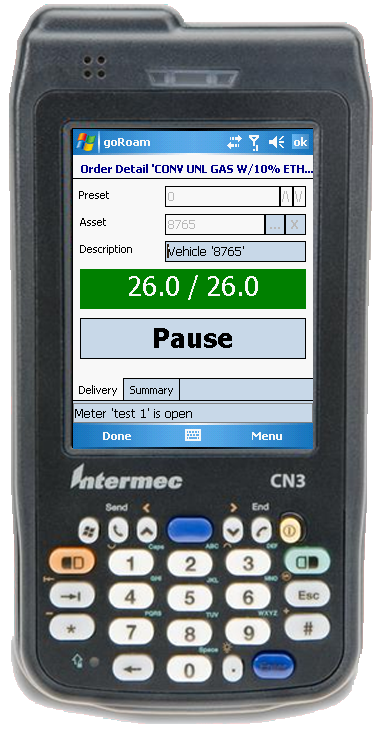 Faster meter integration with LCR-II registers and better visual indicators on meter status. Streamlined workflow so drivers see forms based on the line item they are delivering. For packaged delivery, they see packaged specific data. For bulk products, we differentiate between metered and non-metered as well as the type of asset being filled. For example, on tanks we show tank readings and can force the readings. On vehicles/engines we support odometer or hour readings. Simultaneous dual meter pumping – drivers can pump from two LCR-II or other meters at the same time. Better background synchronization – we use a full queuing system that detects network connectivity and syncs automatically when a device is connected via cellular, wifi or cradle. The updated module will be available by the end of June 2011. The following video provides an overview of the assets module and key attributes for editing and managing assets. The following video provides an overview of managing your company and users. Your company info is used when printing reports or receipts. User administration provides an overview of adding, editing and disabling users.